Here's a game I didn't have room to describe in my ParentMap article on using up Halloween candy. I've done this with my children ages 4-6. Give two players ten pieces each. The first player pushes some onto the table and names a number. The second player adds pieces to reach the number, then takes some away and calls out a new number for the first player to reach. Yes, it's true. 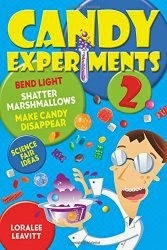 Parents Magazine asked me for some candy experiment ideas to be featured in an upcoming "Play With Your Food" column. It's a perfect fit, since playing with candy is what we do. They were particularly interested in the colorful Skittles Density Rainbow. Wonder if they'll print some good photos? Guess we'll all find out in November. Here's how Warheads react to baking soda water. The more Warheads you use, the more bubbles you'll see.